Nothing tops off a day spent at Walt Disney World like one of their famous fireworks shows! Illuminations and Fantasmic! are great, but we’re most excited about seeing Wishes! Why? Well, partly because the Magic Kingdom is our favorite park, but also because Wishes can be seen and enjoyed from many places in the park, and even outside the park. 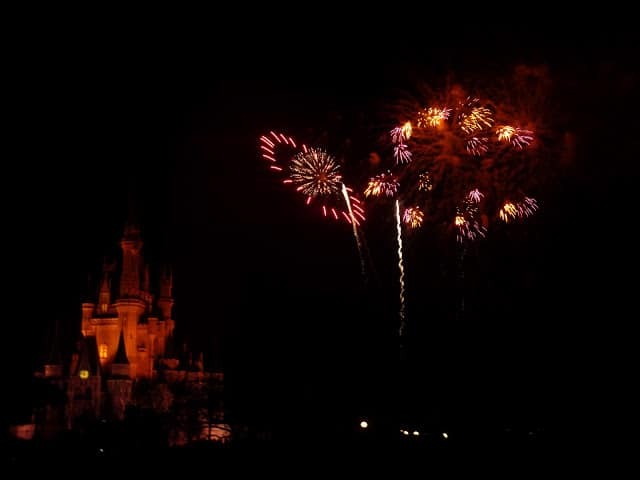 This year, we’re thinking of seeing what it’s like to watch Wishes from New Fantasyland! As a Cast Member years ago, I enjoyed fireworks from Fantasyland many times. The crowds are usually in front of the castle for the display, and you almost feel like you’ve got the place to yourself. With New Fantasyland being, well, new and all, we don’t expect it to be empty at fireworks time, but it should be pretty cool to watch the fireworks from back there! *Other great ways to enjoy Wishes include watching them from the Grand Floridian, Polynesian, Contemporary, or Bay Lake Tower resorts. You can also make a reservation for a Wishes Dessert Party inside the Magic Kingdom with reserved seating for the show! That was #5 on our countdown. We’re getting close, so stay tuned for #4! !